Our second day of the trip took us to New England National Park. An extraordinary place with so many vegetation types and amazing areas to explore. 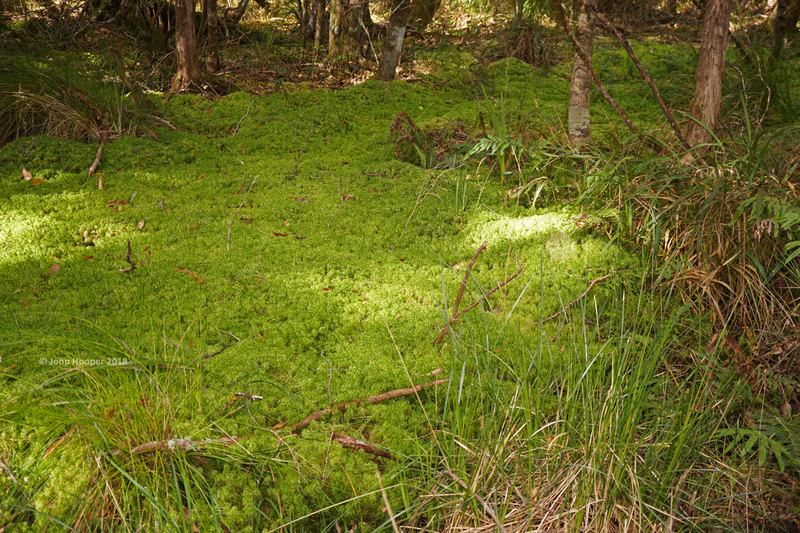 On arrival to the campground, we again set up camp, changed into frogging attire and began our search for the sphagnum bogs, home to the Sphagnum Frog (Philoria sphagnicola). We found the bogs easily, and I think all three of us were enlightened to just how different this habitat is to that of most other Philoria species. On hands and knees from the edge of the bog, we pin-pointed two locations where two males were calling, and put our ears to the ground. After a little while, we found both calling males. The call of this species is rather different to the un-creative call of most others, often described as the passing of wind or ‘flatulence’. As Philoria species generally call in the early morning or late afternoon, by the time we had taken our photos and returned the frogs to their calling places, it wasn’t yet 4pm. We decided to drive to one of the vast lookouts at the top of the park, but the thick cloud and fog at this elevation meant we could not see anything. We decided to embark on a two hour walk, where on one side are high rocky cliffs towering above the track and dripping with water, and the other, a steep embankment and fog clouding our view of the landscape. This was an amazing walk, of which we heard many more Sphagnum Frogs calling from what otherwise seemed an inhabitable place for frogs to breed! See the video below for an insight to this landscape. The humidity along the track was such that we’d all ditched our shirts to allow ourselves to sweat out more comfortably. 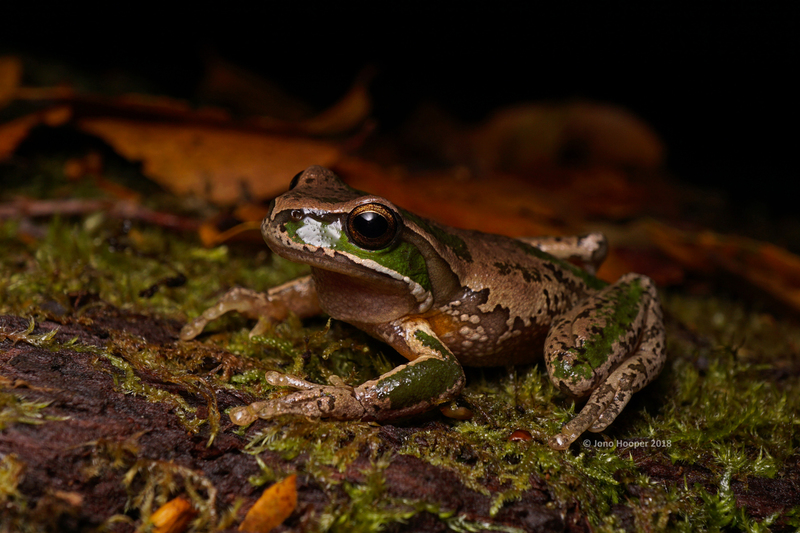 On return to camp, and as night began, we ventured to a nearby creek where both the Stuttering Frog (Mixophyes balbus) and the New England Treefrog (Litoria subglandulosa) had begun calling. 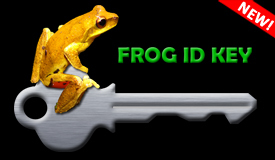 Both are new species for me, and soon enough we had found the handsomely decorated New England Treefrog. Only a few Stuttering Frogs were calling, and the thick stream-side vegetation hid them from view. We knew this species occurred at the next national park, so didn’t spend too much effort at the current site. 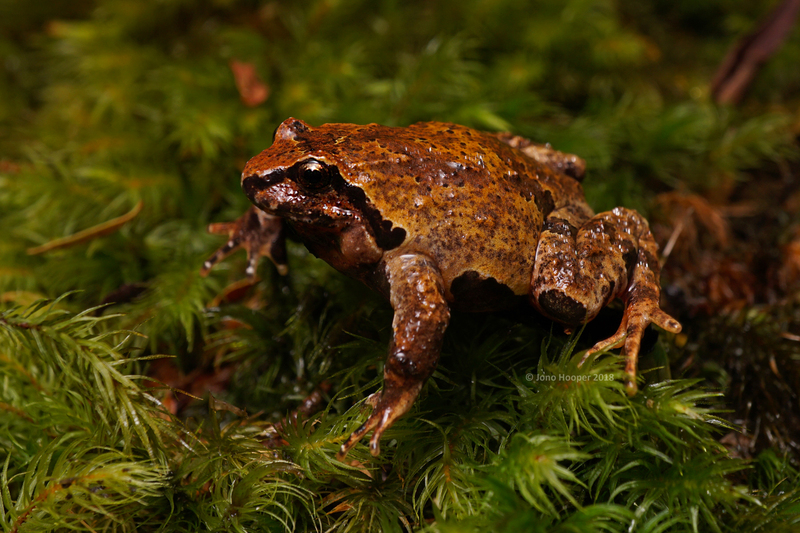 Two species down, and one more was to be found in the New England region, the New England Pseudophryne (AKA ‘false toad’ or ‘broodfrog’). 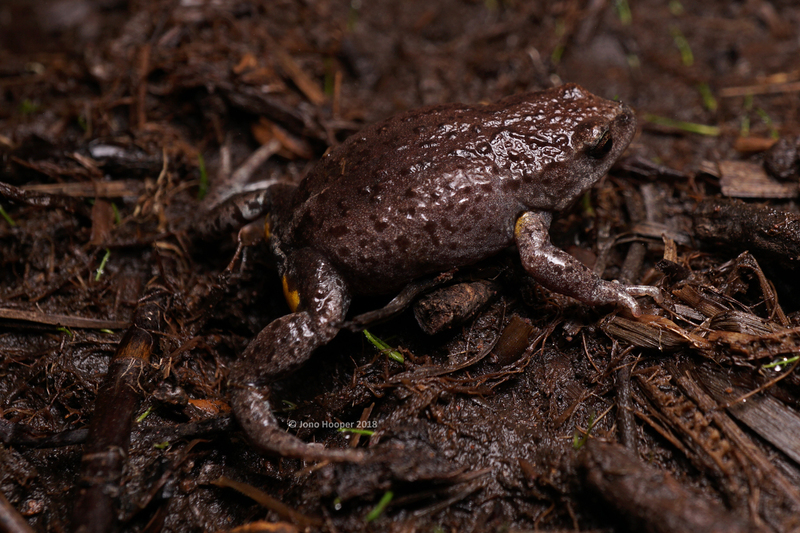 This species is part of the Pseudophryne bibroni species complex, which is currently undergoing genetic research and taxanomic review, which may confirm this Pseudophryne in the New England region as a new species (Webster, Payne pers comm.). 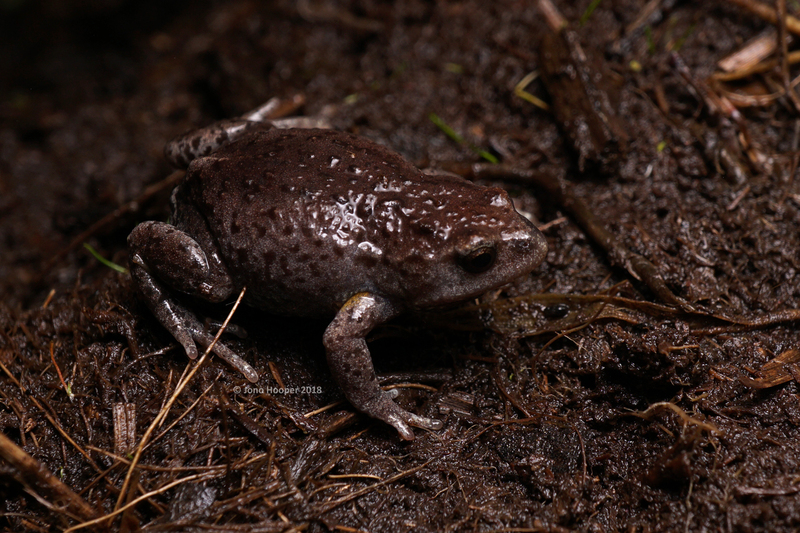 Typical of Pseudophryne, they breed in shallow grassy depressions which would otherwise appear an unimportant grassy wet area. 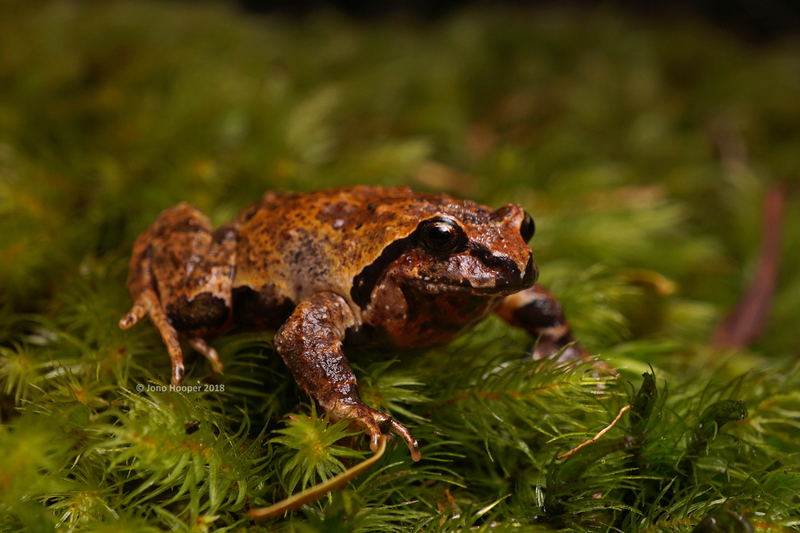 We heard a chorus of these frogs, but finding them proved very tricky and time-consuming. Our unwavering enthusiasm however kept us searching, and eventually one animal was found. A big relief, as the head-ache was kicking in! 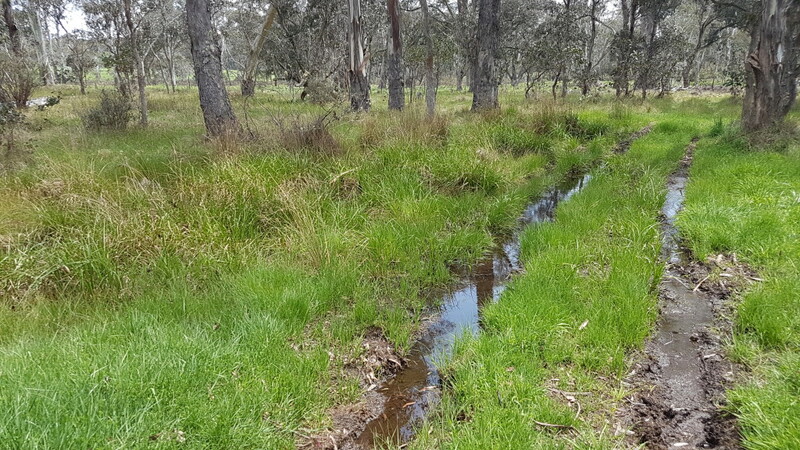 Nearby this site were many New England Treefrogs calling, and we also encountered a Whilsting Treefrog (Litoria verreauxi) and a Striped Marshfrog (Limnodynastes peronii), who looked like he’d been on a diet of protein shakes, steroids and hitting the gym seven days a week. This beast managed to knock down our opinions of ourselves and what pecs, biceps and abs we might have thought we had! 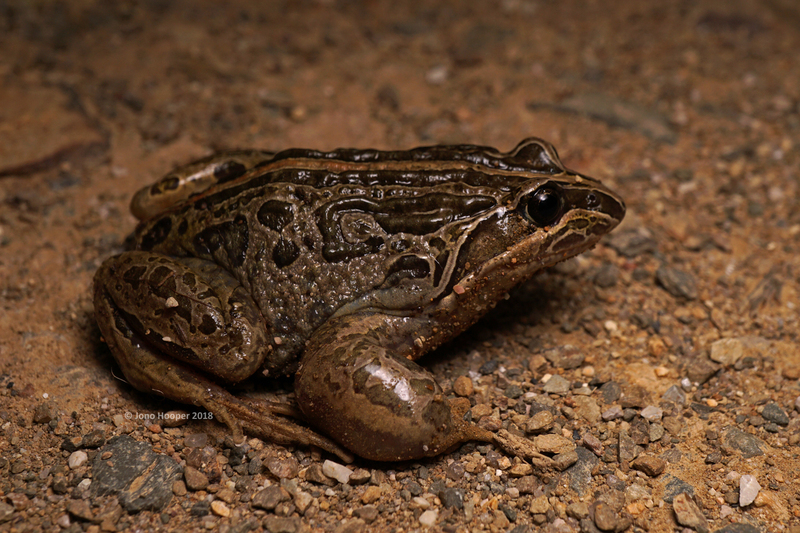 Striped Marshfrog (Limnodynastes peronii). Check out the biceps on this rig! 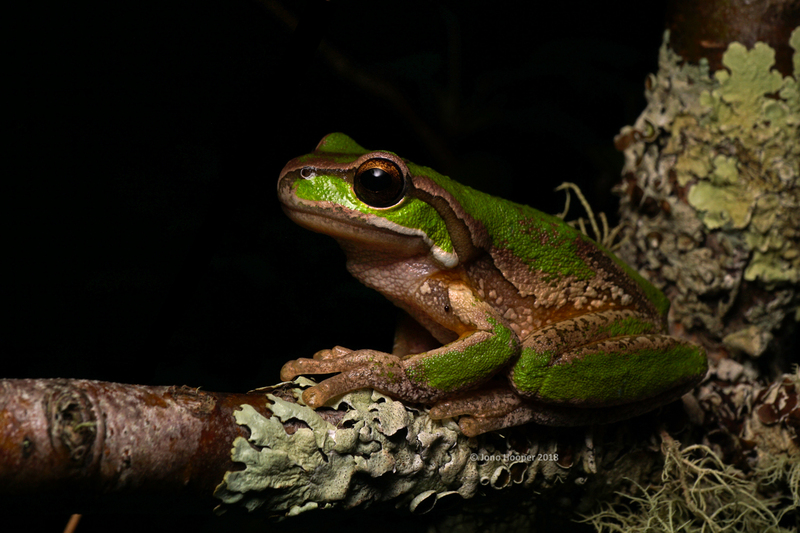 This entry was tagged Glandular Treefrog, Limnodynastes peronii, Litoria subglandulosa, Mixophyes balbus, New England National Park, New England Pseudophryne, New England Treefrog, New South Wales, NSW, Philoria sphagnicola, Sphagnum Frog, striped marsh frog, Stuttering Frog. Bookmark the permalink.